Just letting you know that these crispy low carb whole30 paleo salmon cakes are sponsored by my friends at ALDI! These gluten free salmon patties are made in the air fryer so they’re juicy and crispy without all the oil! A healthy, gluten/grain/dairy/sugar free meal! THE FIRST AIR FRYER RECIPE. I literally have been so pumped to share these little crispy coconut cakes of salmon BLISS with you for, liiike, EVER. Partially because they are so fancy and ON TREND, just like the crispy air fried fish, with the “being cooked in the air fryer situation” at hand. But also ‘cause they are packin’ some MAJOR delicious spicy-sweet flavor and seriously juicy yumminess. With a MEGA DOSE of heart-and-brain-healthy fats to nourish you from the INSIDE OUT. These little low carb whole30 paleo salmon cakes of LOVE are doing it ALL. 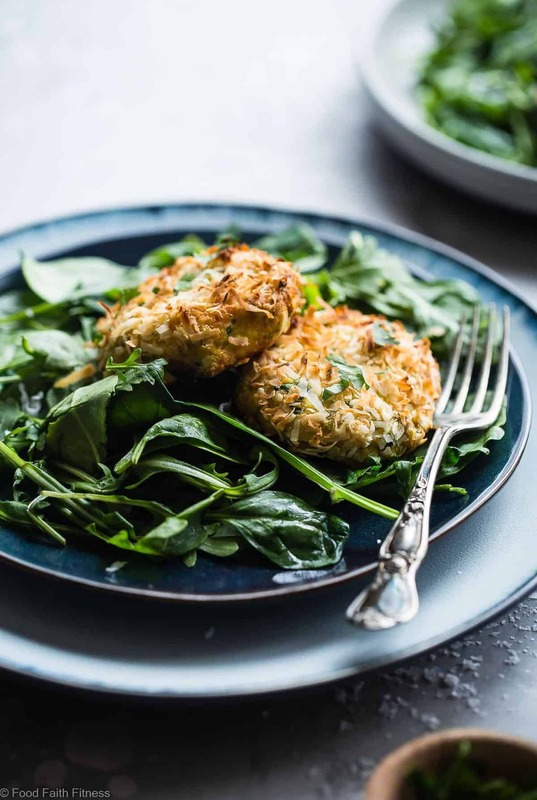 Internet BFF’s, these low carb whole30 paleo salmon cakes are NOT the keto salmon patties that you’ve experienced growing up. You know the ones that are made from questionable, canned salmon, that someone-you-love-but-didn’t-love-as-much-after-they-made-you-eat-them made for you? These little circles of crisp-coconut-curry lovin’ are made from ALDI FRESH Atlantic Salmon! If you did not know, ALDI provides high-quality seafood (I know, I grew up on the west coast!) for SUPER affordable prices. They also work with the Sustainable Fisheries Partnership and Global Aquaculture Alliance to ensure that they are sourcing sustainable seafood whenever they can. Their fish, and shellfish are comin’ from responsibly-managed fisheries! <– Seafood that you can FEEL good about and is GOOD for you. But, really, you can feel good about ALL their ingredients. Spoiler alert: even their baking ingredients ROCK. You can make some DELISH coconut protein cookies! Now, if you live on the face of Earth which, since you’re reading this, I assume that you do, you’re pretty “in the know” that the Air Fryer is the newest Instant Pot. It’s super sleek and cool and everyone is using it to make crispy-crunchy-fried goodness but – GASP – without the deep frying. You know I always have your back, so I decided to get one for myself to see if this contraption IS really as “buzz worthy” as the internet world makes it out to be. SO impressed with how this works. It makes the outside of whatever you’re cooking (I also tried it with paleo orange chicken!) SO crispy and crunchy – maybe even MORE than deep frying?! AND, the inside? All of the juicy-yummy-flavor is still PERFECTLY packed inside. Like in these low carb salmon patties. Whiiiich, I am suggesting (read: demanding) that you make FIRST when your inner-super-cool-person comes out and decides to jump on the Air Fryer bandwagon. 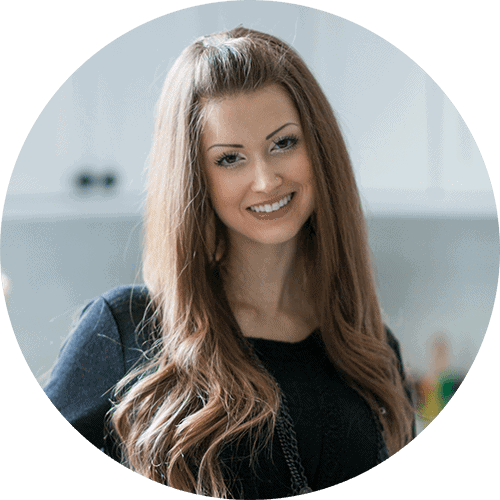 <–And once you’ve tried them, check out these 20 gluten free healthy air fryer recipes! But, don’t worry, I also tried it out in the oven for those of you who don’t have one yet. Notes on that in the recipe! Plus, these paleo salmon patties would make a MEAN alternative to meat if you’re looking for some options for Lent. Just sayin’. 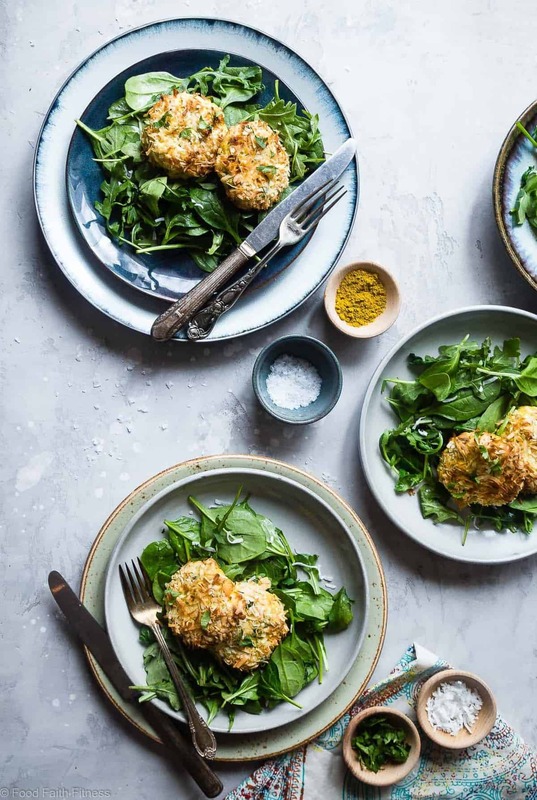 The whole “coconut curry” combo in this keto salmon cakes is PROBABLY a ZERO % shock to you. We’ve had vegan coconut curry with sweet potato noodles AND coconut slow cooker curry. It was only a matter of time until the coconut curry craving creeped in on my Atlantic salmon addiction. 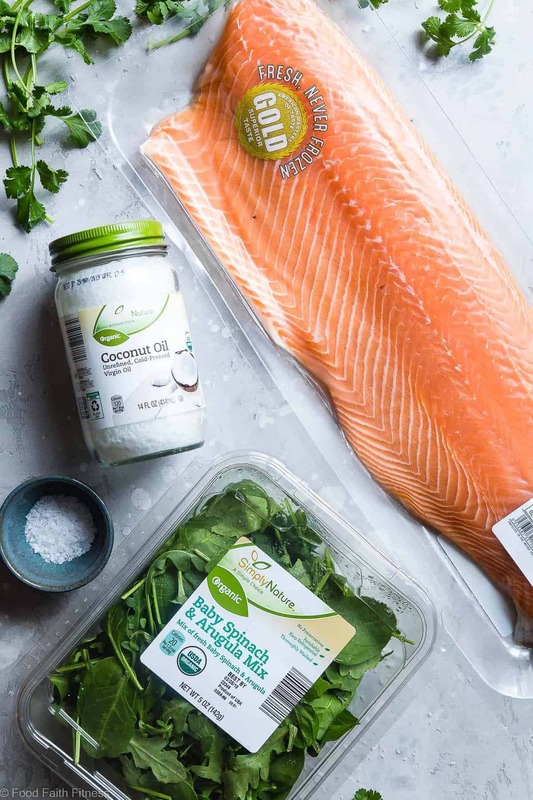 Fresh (<3 <3 <3) Atlantic salmon gets diced and mixed with spicy notes of curry, that warm up the back of your throat with each munch, wrapping your taste buds with a flavorful, herb-y POW of cilantro and that naturally-sweet, coconut CRUNCH. 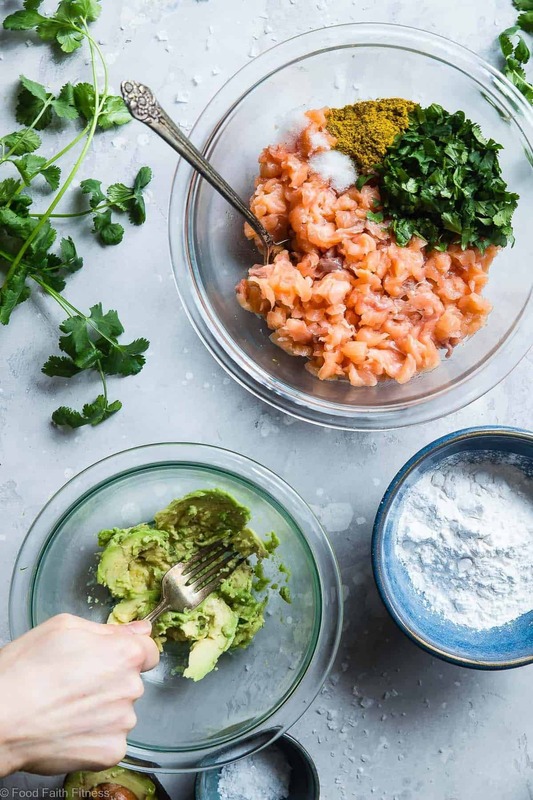 Mix and mingle all of that together with an emerald-green PILE of peppery-arugula and tender spinach that is hugged with a delicate swirl of coconut oil, and you’ve got some SERIOUS salmon goodness going on inside your HUNGRY belly. Canned salmon? No thank you. Imma get a little fresh with you today. These low carb whole30 paleo salmon cakes are made in the air fryer so they're juicy and crispy without all the oil! A healthy, gluten/grain/dairy/sugar free meal! Remove the skin from the salmon, dice the flesh, and add it into a large bowl. Add in the avocado, cilantro, curry powder, sea salt and stir until well mixed. Then, stir in 4 tsp of the tapioca starch until well incorporated. Line a baking sheet with parchment paper. Form the salmon into 8, 1/4 cup-sized patties, just over 1/2 inch thick, and place them onto the pan. Freeze for 20 minutes so they are easier to work with. While the patties freeze, pre-heat your Air Fryer to 400 degrees for 10 minutes, rubbing the basket with coconut oil. Additionally, whisk the eggs and place them into a shallow plate. Place the remaining 1/4 cup of Tapioca starch and the coconut flakes in separate shallow plates as well. Gently brush the tops with a little bit of melted coconut oil (optional, but recommended) and cook until the outside is golden brown and crispy, and the inside is juicy and tender, about 15 minutes. Note: the patties will stick to the Air Fryer basked a little, so use a sharp-edged spatula to remove them. When the cakes have about 5 minutes left to cook, heat the coconut oil up in a large pan on medium heat. Add in the Arugula and Spinach Mix, and a pinch of salt, and cook, stirring constantly, until the greens JUST begin to wilt, only 30 seconds - 1 minute. Divide the greens between 4 plates, followed by the salmon cakes. Garnish with extra cilantro and DEVOUR! Preheat your oven to 400 degrees and line a baking sheet with parchment paper, placing a cooling rack on top of the pan. Rub the cooling rack with coconut oil. Place the patties, coconut-side up, onto the cooling rack and bake for 15-17 minutes until crispy. NOTE: we liked these better in the air fryer, as they do get a little crispier, but they are still good in the oven! Use 2 tsp of coconut flour INSIDE the cakes, and then use the same 1/4 of coconut flour on the outside, before dipping in egg. This will save you about 4g of total carbs per serving, and will increase the fiber by about 4g per serving. We slightly prefer it with tapioca flour, as coconut does make them a little dryer, but its still super yummy! **Depending on the size of your air fryer, you may need to cook these in two batches and keep the first batch warm in the oven. Love these! Light and perfect for spring! This looks so good The salmon cakes look so crispy and the flavors in this salad are amazing! Thank you! They are AMAZINGLY CRISPY! Looks like tomorrow’s lunch just got better for me! I made my first salmon cakes last week! Looks like I have another wonderful recipe to try! I hope you love it Liz! OMG Taylor you alllllways crack me up! “Now, if you live on the face of Earth which, since you’re reading this, I assume that you do, you’re pretty “in the know” that the Air Fryer is the newest Instant Pot.” Lol, girl! So true. And how awesome are these salmon cakes?? Yummy! Hahaha thanks friend! Miss ya! Seriously Taylor, I want to come to your house and be your taste tester. You inspire me!! Ha! You are welcome anytime! 🙂 Thanks! I love salmon cakes! These look SO good! Yum! I love how crispy they are! Oh my goodness, these look AMAZING! Love that they’re Whole30 approved and paleo. Such a win!! Hmmm… maybe a way to sneak some salmon into my kids diet without so many complaints?! I love salmon cakes, and I love that Aldi carries this! Also…all their organic, so amazin. Right?! I love their stuff too! 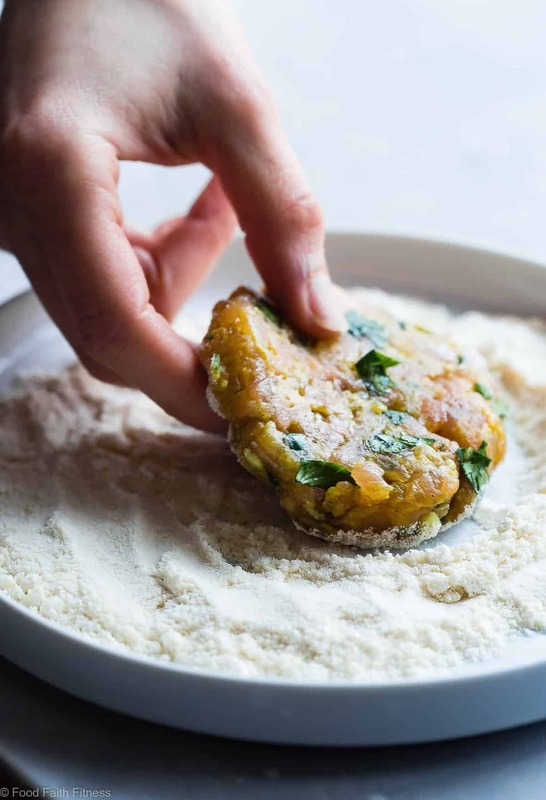 So many salmon cakes recipes use canned salmon – it’s neat to see one using fresh! It makes them so much more delish! I LOVE that used the air fryer, that was so smart! These cakes are perfect! These are definitely a must make for us! We LOVE salmon! 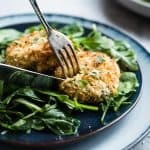 Salmon cakes are my go-to during Lent and I love how these are low-carb! The coconut crust, how wonderful!! My husband has been begging me to try a salmon cake recipe lately and these look AMAZING! I’ve been on the fence about getting an air fryer as well, but these might just push me over the fence. Thank you so much for sharing!! Oh my gosh you need one. Mine LIVES on the counter because I use it every single day!! Absolutely delicious!! Thanks for sharing the recipe! 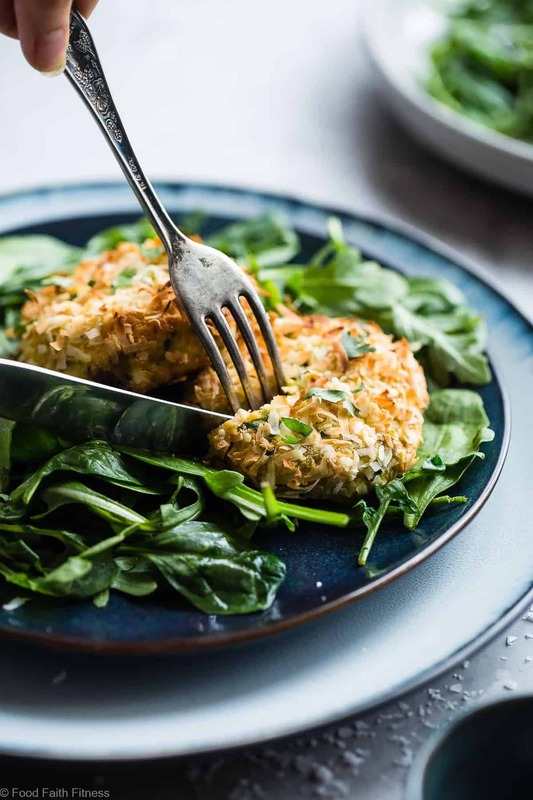 This crispy low carb whole30 paleo salmon cakes recipe is something different and easy to make. Your presentation in pictures making it more mouthwatering. 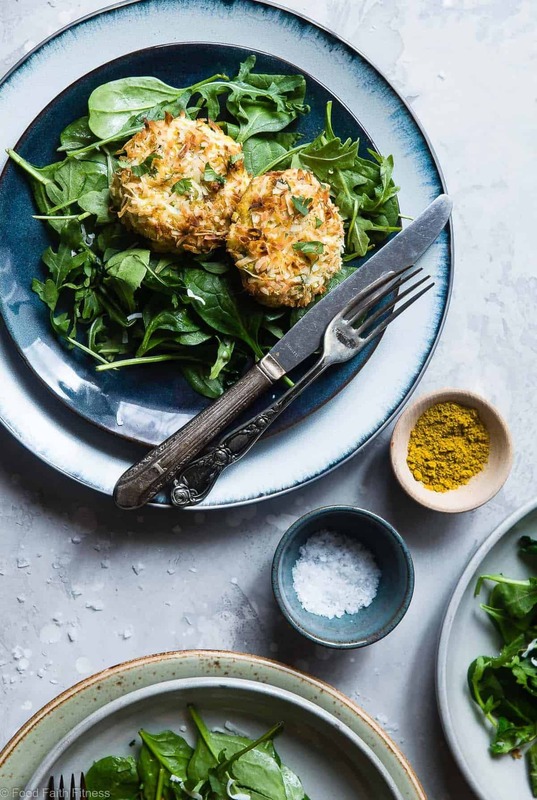 I am surely going to try this crispy low carb whole30 paleo salmon cakes. I really wouldn’t recommend it! Sorry! its impossible not to like all of these recipes! This article is amazing! If I but skinless salmon, how much should I buy? what is the weight of skin on 1 lb. side? I can’t tell you as I haven’t weighed just salmon skin – hope you understand. I would assume it would be close! I’m confused. So did you use 1/2 pound of salmon or 1 pound? 1 Lb which equals half a side of salmon. Thanks for sharing complete method!